Piano Refinishing by using a Vinyl Wrap coating. This means you can change the colour of your piano without damaging the original polish underneath to suit your rooms decor. You can have this applied in Various colours and finishes including Matt, Satin or Gloss sheens. 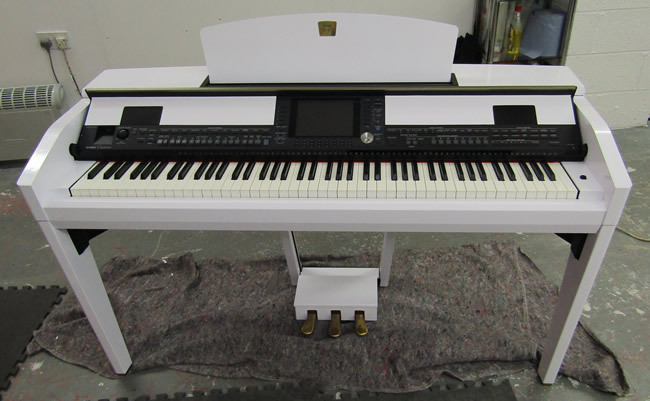 Yamaha Digital piano wrapped in white gloss. 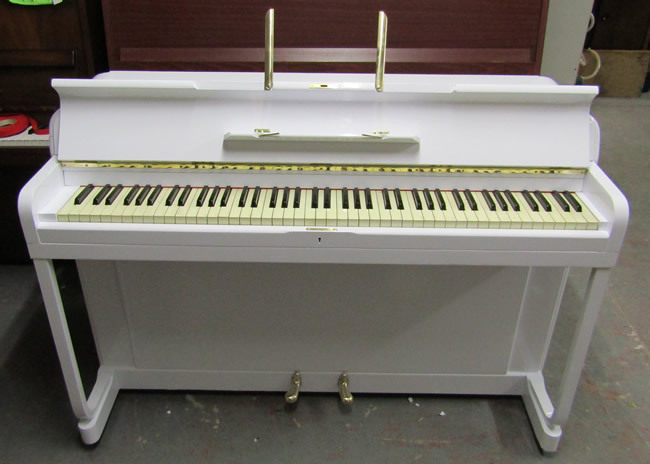 Kemble Minx small modern piano in a white wrapped Finish. This Wrapping process is applied using sheets of Automotive premium quality vinyl wrap, the nature of this process does mean that certain parts have to be overlapped or joined, these overlaps or joints are placed where they are least visible. The majority of the pianos wrapped look nearly as good as a re-polished piano, with the added benefit of being able to change the colour of your piano at a reduced cost compared to re-polishing the piano. This also enables you to remove the Wrap back to the original finish or change the colour again & again at later dates without damaging the finish underneath. Pianos must be clean and free of any damage, if there is any damage this can be repaired at extra cost.